Are you watching the new hit television show Once Upon a Time seen on ABC Sunday nights? 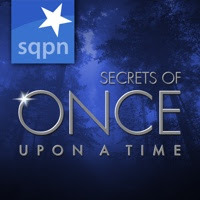 Lisa and I are both big fans and our combined interest led to Lisa being invited to be a regular podcaster on the SQPN Secrets of Once Upon a Time. Adam Horowitz and Edward Kitsis, who brought us Lost, are producing an engaging show where our favorite fairy tale characters are trapped in time, in our modern day world, after being cursed by the evil Queen. The storyline balances back and forth between present-day and fairy tale world flashbacks. Clearly a lot of thought and expense has been used in production, with rich costuming and beautiful settings. Multi-faceted characters bring fairy tales to life withcleverly created backstories. If you haven’t seen it yet, the first six episodes are available on Hulu thru January 9. SQPN: StarQuest Production Network, produces several “secrets” podcasts, or audio talk shows available online and via iTunes subscriptions. In these podcasts co-hosts discuss various plot lines, references to literature, symbolism, irony, and other underlying meanings found in pop culture television shows and movies. The Secrets of Battlestar Galactica podcasts were my first introduction to SQPN. Their most complex and longest running secrets podcast series is the Secrets of Harry Potter. All 9 "secrets" shows are directed at the universal audience of the underlying show. Because we have so much to discuss as we uncover details, large and small, layered throughout this show, these podcasts are around an hour in length. If you’re enjoying the show as much as we are, you’ll be fascinated to consider all the different angles and theories we toss about. Why does the evil Queen (Regina) hate Snow White (Mary Margaret) so much that she wants to take away all the happy endings, trapping them forever in the curse? How is Emma going to break the curse and bring back happy endings? What does the “magic” represent – could it be a metaphor for love? Subscribe to the Secrets of Once Upon a Time podcast on iTunes. Tune in on Sunday nights to ABC and then tell us what YOU think about the episode.